Well seasoned meat on top of a soft pita and creamy flavorful tzatziki sauce…a perfect dinner for any night of the week. Place pork, onion, garlic, oil, oregano, allspice, lemon pepper and lemon juice into slow cooker. Remove lid. Using tongs remove the pork and place on a cutting board. Shred or slice the pork and place back into the slow cooker. 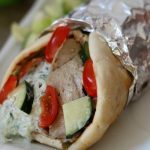 Serve the pork and onions on the top of pita bread with Tzatziki sauce, lettuce, cucumbers and tomatoes. Combine yogurt, cucumber, dill, salt and garlic in medium bowl. Stir until creamy and combined.